Toyota has a message for anyone who still doubts the potential of hydrogen fuel cell electric vehicles: Lalalala we can't hear you! 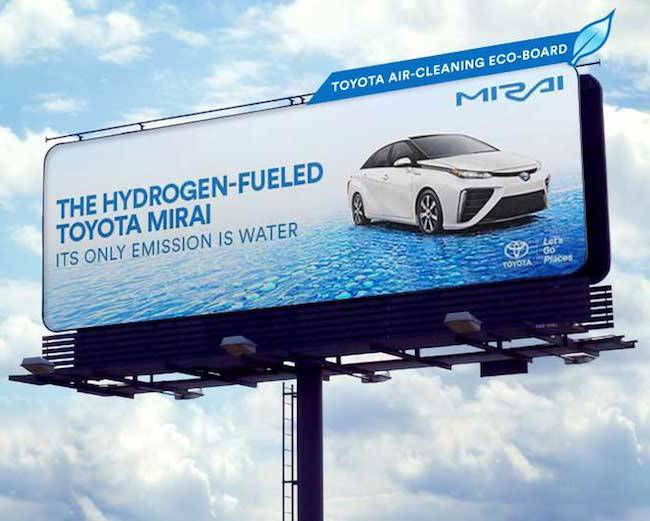 The company is set to launch a major new ad campaign for the Mirai sedan, its signature venture into the fuel cell mobility market, that consists of 37 billboards spread across Los Angeles and San Francisco. Billboards generally get a bad rap as eyesores, and in that regard a billboard campaign doesn't exactly square with an environmental theme. But Toyota devised an unusual twist that makes a logical connection between outdoor advertising and a zero-emission car. For those of you new to the topic, hydrogen fuel cell vehicles are just that: electric vehicles. The difference is that conventional EVs use batteries, which have to be recharged periodically. Fuel cell EVs generate their own electricity on the go. They need to be fueled up periodically with hydrogen. Battery EVs have a jump on the zero-emission mobility market, thanks partly to the public relations genius of Tesla's Elon Musk. Toyota is among a number of legacy automakers that are making the push for fuel cell EV technology. The bet is that although fuel cell EVs are pricier now, they could compete with battery EVs for market share over the long run as costs go down. The U.S. Energy Department seems to agree. The agency is eyeballing sustainable hydrogen and fuel cell EVs as key factors in the deep decarbonization of the U.S. economy. The new Mirai billboard campaign will run from April 3 to May 28. 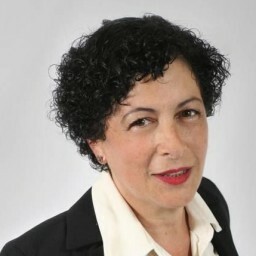 And here's the kicker: The new billboards will "reverse the equivalent of 5,285 vehicles worth of nitrogen dioxide (NOx) emissions per month," Toyota said in a press statement. "When oxygen reacts with the energized titanium dioxide catalyst, NOx is converted to nitrate and removed from the air. The light-activated, smog-reducing billboards continue to purify the air as long as light, humidity, airflow and the titanium dioxide coating are present." To publicize the new promotion, Toyota displayed a similarly-clad Mirai at the entrance to the first Environmental Media Association Impact Summit in Los Angeles last week. Clear Channel turns to green advertising...? In another interesting twist, the billboards are provided by Clear Channel Outdoor Americas, which comes under the umbrella of the mega-company iHeartMedia, formerly known as Clear Channel. Under the George W.Bush administration, Clear Channel established an affinity with the right side of the American political spectrum, a relationship that has continued (think: Rush Limbaugh). "We are pleased to offer our environmentally-conscious clients, like Toyota, an even more eco-friendly printed vinyl option for their Out-of-Home (OOH) media campaigns ... This campaign marks a U.S. first for the use of this technology on OOH, and we look forward to making it available to other like-minded advertisers." The pollution-scrubbing technology comes from PURETi Group, which has an exclusive usage agreement with Clear Channel Outdoor Americas for the outdoor category in the U.S.
PURETi has also lent its technology to a campaign in the U.K. for Naked Juice, marking the first time that the beverage company has used outdoor advertising. Photo (cropped): courtesy of Toyota.